Have you ever come up with an idea and you think “Wow.. this is either brilliant or a total hack that no one under any circumstances should consider!"? That’s the situation I find myself in today. I either did something so monumentally stupid that Eric Shupps and Andrew Connell would love nothing more than slap me upside the head (which they probably want to do anyway) or it wasn’t totally stupid and you’ll think “Hey… that’s not a bad idea.”. So… which is it? Well… allow me to explain the situation to you. We are in the process of developing a fairly involved Silverlight application for our current project. 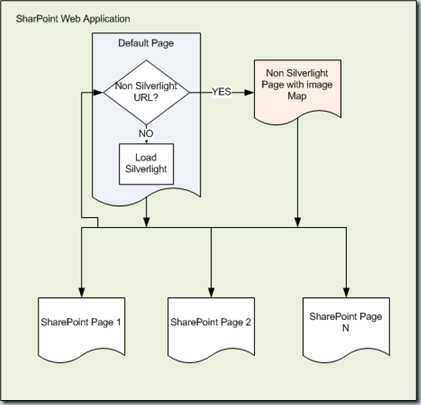 This is an interactive application with animation and links that load different SharePoint pages. It’s pretty fancy and LARGE. I won’t even tell you how large it is because you will do a spit take and ruin your fancy computer. 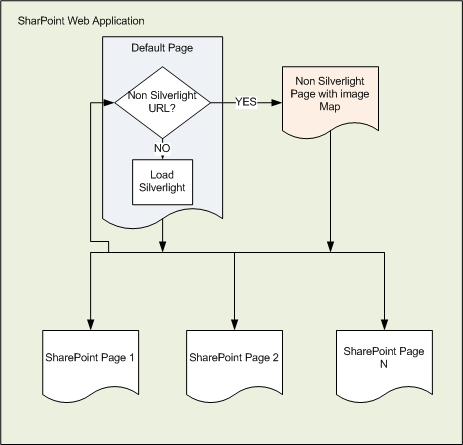 The links in this interactive Silverlight application take users to different SharePoint pages with the content they are seeking. Overall, nothing complicated technically. Anyway, because of the size and scope of the application we needed to create a “non” Silverlight version for users to access. Another requirement was that we give the users the ability to switch between Silverlight and non Silverlight as needed. Again, this is not a big deal, we created a few pages that were basically image maps that took the users to the correct SharePoint pages just like the Silverlight Application did. You start to see the problem? 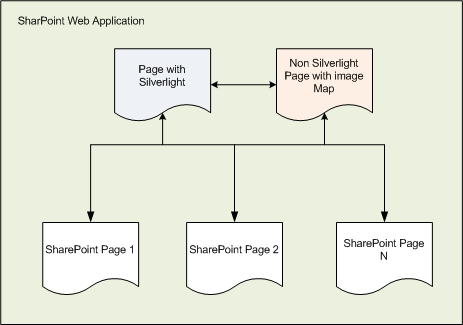 There are links on the SharePoint Pages that take the user back to the “Main” application which is either a page with Silverlight or a page with an Image map. How do you send the user to the correct place all the time? So… what did you do? So… I had a random thought.. not quite an epiphany… The problem is you need to know at any point in the entire web application if the user is wanting to use the Silverlight or Non Silverlight version and then take that user back to the right page. So.. this is where the hare brained scheme comes in. When you extend a Web Application you get another IIS Web site (a different URL) but expose the same content to your users. Historically you extend a web application if you want to set up another authentication zone for your users (Some users log in with AD and other log in with FBA for example). However, you CAN use the same authentication on both. So, what does extending a web application do for me here?? If I extend our web application and get a new URL I can then use one URL for the “Silverlight” version and another URL for the “Non Silverlight” version and I’ll always know which version a user is using. You may be thinking that is a lot of overkill, but think about this. All your links on your SharePoint page are (or at least should be) relative links. This means that regardless of whether you are using the Silverlight or Non-Silverlight version your navigation won’t have to change at all for navigating around, and you will ALWAYS know if a user should be using the Silverlight or non Silverlight version without worrying about cookies or session variables or anything else that might time out on you. So, now I know if a user is using the “Silverlight” version or “Non Silverlight” version at all times based on their url. Following me so far? So, your first thought may be.. “So what! I still have to check that URL everywhere and determine if I need to send the user to the Silverlight page or non Silverlight page! That’s just as much work!. Plus! How in the world do I handle the navigation menu and the bread crumb? This is just a stupid idea you have going here”. Does that make sense at all? It is 6pm on Friday… my brain is already checked out for the weekend. 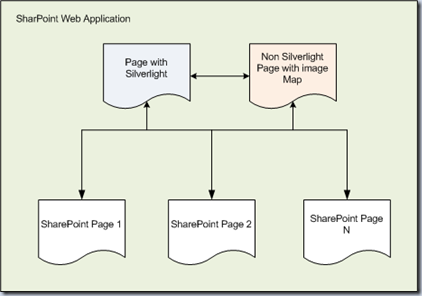 If a user is using the Silverlight URL then the page loads normally and when they go back to the Default page from a SharePoint page the Silverlight works normally. However, if a user is using the Non Silverlight URL the default page will automatically direct them to the Non silverlight page, and any time they navigate away from the SharePoint page back to the default page (via links, breadcrumbs, navigation, or even the “back” button) they will automatically get redirected to the Non Silverlight page from that default page. And the rest just worked. I’m all about the KISS principle and I could not think of anything more easy to maintain and straight forward than this. Create a base URL, myapp.com/silverlight and myapp.com/nonsilverlight. Then make both apps use relatives URLs, if they click the silverlight/non silverlight button, it replaces the base url.